Left for dead a few weeks ago, Herman Cain's long-shot presidential campaign was resurrected by a surprising win in the Florida straw poll, upsetting front-runners Rick Perry and Mitt Romney in the process. In a CNN interview, Cain found his swagger and proclaimed, "African Americans have been brainwashed into not being open-minded, not even considering a conservative point of view." Warming to the subject, Cain speculated on his ability to draw black votes away from President Obama. "Now, the good news is I happen to believe that a third to 50 percent of the African Americans in this country, they are open-minded. I meet them every day. They stop me in the airport. So this whole notion that all African Americans are necessarily going to stay and vote Democrat, vote for Obama, that's simply not true. "I do think a third of them would vote for me based on my own anecdotal feedback." "Based on my own anecdotal feedback" is another way of saying, "I didn't use any sort of verifiable scientific method to reach this conclusion, so for all you know, I made it up." Never mind that. The right-wing mafia jumped in to co-sign Cain's comments, with Bill O'Reilly suggesting that Democratic entitlement programs are what attracts blacks to the party, and Pat Buchanan reviving the "liberal plantation" line. While white conservatives have fallen all over themselves out of gratitude for the opening that Cain provided, NPR blogger Frank James isn't getting the same sort of tingle from Cain's critique. "Cain makes it sound like African Americans are too weak-minded or stupid to recognize what's in their own self-interest." James said. "Again, not the best way to win over voters." James is right that Cain's game is to make African Americans sound weak-minded or stupid. James is wrong that it's not the best way to win over voters. That depends on which group of voters you're gunning for. While black voters aren't likely to find insults to their intelligence an effective sales pitch, the support that Cain really hopes to gain will come from people who think pretty much the same thing. Cain isn't unpopular with blacks because he's an "ABC" — American black conservative (his phrase, not mine). It is well established that there is plenty of conservatism in the black community. However, there is a huge disconnect that has kept that conservatism from being translated into Republican votes. Cain and his small cabal of ABCs do not articulate views or positions that resonate with the African-American voter, and the GOP has shown little interest in turning black conservatism into black votes. In all the debates the GOP presidential candidates have participated in, there has been complete silence about the 16.7 percent black unemployment rate. Cain won't be the first to bring it up. It does him no good with white conservatives in Ames, Iowa, and Manchester, N.H., to mention black joblessness in Detroit and St. Louis, Mo. They don't care about that, and Cain won't be the one to try to get them to. Cain simply accepts the current Republican orthodoxy — no matter how little it helps African Americans, and even when it runs counter to their interests. Unlike Frederick Douglass, the quintessential Mr. Black Republican, Cain doesn't believe that "power concedes nothing without a demand." When it comes to questioning Republican power, Cain dummies up and keeps his silence. That is being blind. That is being brainwashed. Insulting blacks by calling them brainwashed gains Cain no pull with them, but it certainly plays well with whites who believe the same thing and are happy that they have Cain to say out loud what they mutter under their breath. Cain is playing a cynical game. He's willing to insult black Democrats to attract white Republicans. There won't be enough of them to put Cain on the ballot, but Cain was never running for president in the first place. His is a vanity campaign with the goal of selling books and cranking up his speaking fees. On that score, he should be wildly successful. If stabbing black folks in the back and climbing over the corpses is what it takes to get over, hey, a hustler's got to do what a hustler's got to do. It's hard out here for a pimp. Black people may do some crazy things, but voting for Herman Cain ain't one of them. Cain is a useful shield for conservatives accused of racial insensitivity. "To all of those people who say that the Tea Party is a racist organization, eat your words," Cain said when he entered the presidential race. The Tea Party eagerly seizes upon the handful of blacks, like Cain, who agree with them to proclaim, "See, we can't be racists. Herman Cain says we aren't!" Yet even Cain can't totally ignore racial realities. When the Washington Post published the story about the provocatively named "Niggerhead" hunting camp leased by Texas Gov. Rick Perry's family, Cain broke Ronald Reagan's 11th commandment and spoke ill of a fellow Republican. "My reaction is, that's just very insensitive," Cain told Fox News. "[There] isn't a more vile, negative word than the n-word, and for him to leave it there as long as he did, before I hear that they finally painted over it, is just plain insensitive to a lot of black people in this country." Yet after white conservatives rose up in outrage — not against the Niggerhead hunting camp but against Cain's criticism of Perry — he backed down. He blinked. It's a risk for Cain to remind his supporters that he is actually black. 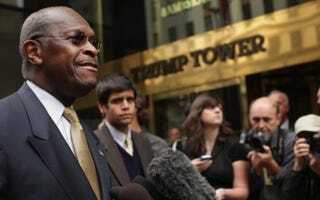 Cain and other black conservatives can't risk losing value to their patrons in the Tea Party and the right-wing base. When it comes to brainwashing, Herman Cain should look in the mirror. Jeffrey Winbush is a frequent contributor to The Root.